Discussion in 'How is your display put together...' started by Nodent, Dec 23, 2014. I would like to build meteor rods with only 1 - 4 pin connector per rod. I have drawn up a wiring theory. What do you think. That's exactly how I did mine and they work great. I have joined them with 3 core pigtails. I asked Ray if he could make these 3 Core Splitter/4 Core middle and he did so but only after I'd already made my pixicles. The idea I had was to wire as you have and connect to a 4 core pigtail. I could then connect to the splitter I have linked. So Ray is versatile I take it? Will Ray create, say a 50 foot long line with 10 tee's incorporated in it? Would be interested in those pigtails too, but make sure Ray tests them and then you retest them. I got an order with 10 2 wire T's, one literally melted and 8 of the remaining 10 are defective, so 90% failure rate! Still need to email ray about that! Ray indicated he can make me 15m cable with 10 tee in it for $18 USD. I think I will order 4. But first I will use rope to make sure a 1.5m spacing will do the justice. I've had decent luck with the 3 wire and the 4 wire as well, only a couple failures out of 10, all my 4 wire the molding has gaps in it though. I just had Ray make up 30 of these. 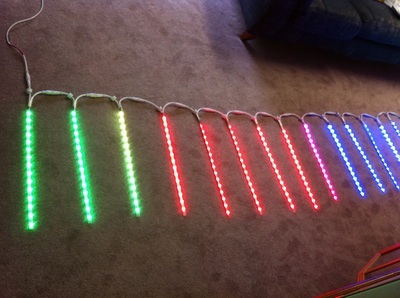 Each one is 1M long and includes 5 x 4 core connects so a total of 150 with each one being 20cm apart. I am going to use the 30/m RGB ribbon cable. He made them up within a week and expected delivery is tomorrow. only cost $150. Sorry made a mistake it's $180 as they were $6 each and not $5. Worked out cheaper then the one Ray has as it uses less joiners. Is that not a good price? I just checked Aliexpress and I was right the first time $150. I'm having a bad night. Yes it's not worth your time and its a much better job. It's actually 150 going down and 60 to join them all so 210 in total.